Last weekend an amateur astronomer peered through his telescope and found a new comet the old-fashioned way -- by looking. August 24, 2001: In centuries past astronomers discovered new comets the old-fashioned way: they peered through telescopes or simply looked toward the sky, hunting for faint smudges that no one had seen before. It was hard work, but lots of people did it. Comets are named after their discoverers, after all, and finding a new one can mean instant fame. Hale-Bopp, Hayakutake and Shoemaker-Levy are just a few of the names we know ... because of comets. But lately it seems just about every new comet is called "LINEAR" or "NEAT." Those are names, too, but not the names of humans. They're robots -- automated, computer controlled telescopes that scan the skies in a relentless search for near-Earth asteroids and comets. This year between January and mid-August such telescopes recorded 18 new comets, while humans had found none. Above: Comet Petriew photographed on August 23rd by Tim Puckett a using a 60 cm Ritchey-Chretien reflecting telescope equipped with an Apogee AP-7 CCD camera. Comet hunters -- the human kind -- just can't compete! At least that's how many beleaguered sky watchers have been feeling. But last weekend an amateur proved humans can still bag a comet and do it the old-fashioned way. Vance Petriew of Regina, Saskatchewan -- a computer consultant by day and an amateur astronomer by night -- was at the Saskatchewan Summer Star Party on August 18th when he turned his 20" telescope toward the Crab Nebula. Hopping from one star to another across the constellation Taurus, Petriew guided his telescope toward the famous supernova remnant -- but he never made it. He stopped instead at a curious smudge that appeared unexpectedly in his eyepiece. "I almost passed it by because I was looking for the Crab Nebula," says Petriew, "and this wasn't it." But there was something intriguing about the smudge, something that made Petriew investigate further. "Thinking it might be a galaxy, I looked at my star charts to see if any were nearby. Just then Richard Huziak (Saskatoon Centre, Royal Astronomical Society of Canada) happened to walk over for the first time that night." Huziak was familiar with the region of sky and knew that no eye-catching galaxy was in the vicinity. The pair quickly realized that Petriew had stumbled onto an unknown comet. "It's like winning the lottery!" says Petriew. "Only [two people] in the whole world discovered a comet last year the same way I did. It's pretty cool to have one named after me and I'm very excited!" 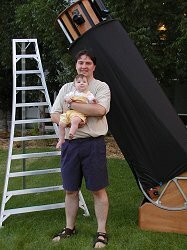 Right: Vance poses with his 8 month old daughter Emily and the 20" Obsession telescope he used to spot the new comet. Petriew announced his discovery hours later, and since then astronomers have been monitoring the newfound comet to learn more about it. Based on data spanning less that a week, it appears that Comet Petriew may be traveling around the Sun once every 5.5 years following an elliptical path that stretches from a point just inside Earth's orbit (0.95 AU) out to the realm of the giant planet Jupiter (5.3 AU). Very long ago -- perhaps hundreds of millions of years -- Comet Petriew inhabited the Kuiper Belt, a doughnut-shaped cloud of dormant comets that circle the Sun beyond Neptune. Kuiper Belt comets tugged by the gravity of giant planets in the outer solar system can be nudged closer to the Sun, where they might eventually settle into orbits with periods of only a few years. Comet Petriew appears to be one of these, a short period object that will revisit the inner solar system frequently. At the moment Comet Petriew is near perihelion, its closest approach to the Sun. Solar heat is vaporizing the comet's icy outer layers, unleashing a cloud of gas and dust around the nucleus. That amorphous cloud, which astronomers call the "coma," is what caught Petriew's attention when he swung his telescope through Taurus last Saturday. Photos captured since then reveal a short tail, not much bigger than the coma itself. Seen through modest telescopes Comet Petriew has the look of a cosmic tadpole. , which shows the location of Comet Petriew every day for a month beginning August 22, 2001. "The comet should be around magnitude 10.5 this weekend," says Petriew. After that it will slowly fade as it recedes from our planet, as well as from the Sun. If the comet is well-behaved, it should remain brighter than 11th magnitude through mid-September. "You will probably need a 6-inch telescope or larger to see it," he added, "although a very keen observer might spot it using a 4-inch." No doubt plenty of astronomy enthusiasts will haul their telescopes outdoors in the weeks ahead to peer at the new comet. And perhaps some of them will scan the skies for comets of their own. It's worth a try. After all, Vance Petriew is living proof that not every comet's name is LINEAR. Catalog of Comet Discoveries - See how humans are faring as comet hunters in recent years. The Puckett Observatory -- Astronomer Tim Puckett provided CCD images of Comet Petriew for this story. P/2001 Q2 (Petriew) - images and information about the new comet from Gary Kronk's Cometography.com. Finder Chart - courtesy of Vance Petriew, this chart shows the motion of Comet Petriew against the background stars for the next month. Saskatoon Centre of the RASC - Vance Petriew is from Regina, Saskatchewan, and a member of the Regina Centre of the RASC (Royal Astronomical Society of Canada). 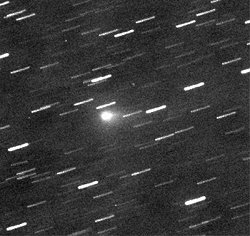 Computerized Comet Hunters -- Learn more about programs like LINEAR and NEAT that have dicovered most new comets in recent years. The Crab Nebula - This is what Vance Petriew was looking for when he stumbled onto the new comet.